The influence of vegetative cover and food on space use by Song (Melospiza melodia) and Field Sparrows (Spizella pusilla) was examined experimentally within an early successional field. Eight experimental patches were established, representing two replicates of all the combinations of the addition or non-addition of food and/or the placement of a single brush station. The effect of experimental treatments on patch selection was evaluated. Each experimental patch was divided into cut and uncut areas to examine the effect of weedy cover on within-patch distribution. The influence of brush and food on distribution between these areas also was examined. Finally, the effect of brush, food, and weedy cover on patterns of spatial distribution within patches was determined. A greater number of birds were found in patches with food addition as compared to those without. Between-patch distribution was not influenced significantly by brush stations or brush and food. Within patches, a higher number of birds were found in uncut areas as compared to cut areas. Higher use of cut areas was observed in plots with food and with brush. Proportionately more Field Sparrows than Song Sparrows foraged in cut areas. Weedy cover affected patterns of spatial distribution. In cut areas, birds were concentrated near plot centers, close to cover. In uncut areas, distribution was not skewed toward plot centers. Brush stations influenced spatial distribution toward woody cover in cut areas, but not in uncut areas. 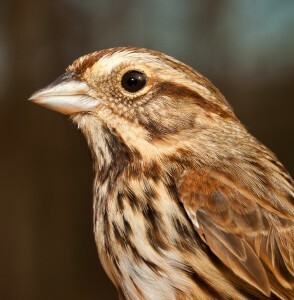 Within-patch patterns of distribution suggest that: (1) perceived risk of predation may be important in determining distribution; (2) weedy cover may moderate the influence of woody cover on spatial distribution; (3) Field and Song Sparrows may balance the trade-offs between predation risk and foraging rate; (4) difference in distribution between Field and Song Sparrows may allow for coexistence in this system.